Energy input in agriculture has increased tremendously and accounts for about 17% of total energy consumed in the USA. Precision agriculture involves knowledge-based technical management systems to optimize application of fertilizer, chemicals, seeds, and irrigation resources to reduce input costs and to enhance crop yield while simultaneously reducing harmful environmental impacts associated with inefficient use of agricultural inputs. It also uses GPS-based auto-guidance systems in agricultural vehicles to reduce overlapping of equipment and tractor passes, thus saving fuel, labor, time, and soil compaction with environmental benefit. This study was undertaken to quantify the fuel and labor savings resulting from adoption of precision agricultural technology in the upper mid-west state of North Dakota in the USA. A survey was conducted with responses from farmers of various demographics about savings of time and fuel in their agricultural vehicle by the use of GPS guidance and autosteering systems. It was found that 34% farms used GPS guidance systems, reducing machine time and fuel consumption by 6.04% and 6.32%, respectively. Twenty-seven percent of the farms used autosteering systems, which further reduced machine time by 5.75% and fuel consumption by 5.33%. GPS guidance and autosteering systems can save an average of 1,647 and 1,866 L of fuel per farm respectively. The monetized values of time saved for the average farm are US$733.85 and US$851.27 for GPS guidance and autosteering systems, respectively. The farm energy savings in terms of fuel and time by using GPS guidance and/or autosteering systems in farm vehicles in the Upper-Midwest region of the USA was estimated from the survey results. Based on the perceptions of farmers adopting precision agriculture, the two technologies investigated in this research provided a positive return on investment and would be beneficial to North Dakota’s agricultural sector if adopted more widely. Precision agriculture involves the development and adoption of knowledge-based technical management systems with the goal of optimizing application of fertilizer, chemicals, seeds, and irrigation resources to reduce input costs and maximize production. Precision agricultural technology has the ability to spatially vary the rates of all inputs to tailor to the varied production potential within the field, which can be gauged by use of geo-referenced historical crop yield data. Variable rate technology (VRT) can be used in both conventional and conservation tillage systems. Adoption of VRT technologies can reduce fuel use, since VRT coupled with GPS guidance systems reduces implement overlap during input applications, thus saving labor and machine hours . The US agricultural energy use has increased tremendously in the last 50 years and accounts for approximately 17% of total national energy use. Approximately 400 gal of oil equivalent is used annually to produce the food that feeds each American; 19% of this is used to operate field machinery . Precision technologies such as auto guidance reduce overlapping of passes while planting seeds or applying chemicals and fertilizers, which results in less fuel usage and labor time. The decreased application of chemicals and fertilizer also results in reduction of energy consumption by the agricultural machinery and reduced expenditure on inputs. Natural Resource Conservation Service (NRCS) of the United States Department of Agriculture (USDA) estimates that even if only 10% of the US farmers use a guidance system for planting seeds in the USA, 16 million gallons of fuel, four million pounds of insecticide, and two million quarts of herbicide can be saved annually . This will not only result in energy savings, but also financial savings for producers. A study by Clemson University showed that spatially varied tillage depth reduced energy requirements by 56% and fuel consumption by 34%. They also found that there is a potential energy savings of up to 52% by using variable rate irrigation systems . Little research has been done relative to energy saving through precision agriculture, but USDA-NRCS has estimated the savings. A recent study by USDA notes that overlaps can be reduced from 24 to 2 in. by using a guidance system, which saves about US$13,000 in variable costs annually for a farm of 1,000 acres . Based on these estimates, a GPS guidance system provides a substantial return on investment and pays for itself within one year. The return on investment increases with the size of the farm as the annual savings increase and the equipment cost is spread over more acreage. Provision of free GPS signals by the federal government has encouraged producers to use new precision tools, techniques, and services to enhance their efforts to save energy and reduce costs . Different tillage systems can also play an important role in reducing fossil fuel use in farming operations. By practicing no-till farming, a farmer can save 3.9 gal/ac, or US$13.65/ac, assuming diesel fuel costs of US$3.50/gal . Shibusawa  noted that the energy input–output ratio for crop production is very high, especially in fruits and vegetables. The machinery fuels and agro-chemicals derived from fossil fuels (including fertilizers, herbicides, and pesticides) are the major sources of high energy inputs in crop production systems. This research has two major objectives: (1) to estimate the rate of adoption for GPS guidance and autosteering systems among agricultural producers of the Upper Midwest region of the USA and (2) to estimate the energy savings attributable to the adoption of these two precision agriculture technologies in crop production in the Upper Midwest region. Upper Midwest region of the USA is comprised of rural states and the economy of the region mainly depends on agriculture. The state of North Dakota is a part of this region and situated in the latitude of 45° 56′N to 49° 00′N and longitude 96° 33′W to 104° 03′W. North Dakota experiences harsh, long winters, which usually begin in late November and continue through late March . As a result, the crop cultivation period in North Dakota very short. But the farmers of the state have large capital resources with high land holding. Table 1 displays the farm statistics of North Dakota . The average farm size is 502 ha (1,241 ac), and tremendous time and energy is spent in land preparation, planting, spraying, and harvesting using machines. Precision agricultural technologies like GPS guidance and autosteering systems help reduce overlapping of equipment and tractor passes to save fuel, labor, and time . These technologies may be especially valuable in regions such as North Dakota, where fixed costs of equipment can be spread over large farms. (Adapted from NASS/USDA in 2007 ). GPS guidance and autosteering systems are used in agricultural equipment to increase operational efficiency and effective field capacity, resulting in more area covered per unit of time. The GPS guidance systems are used for parallel field operation with predetermined swath width across the field. It consists of GPS receiver, antenna, controller, and the display of choice, including either a light bar or a monitor. It can also have additional features such as a data logger, sound device, or visual display . The GPS receiver can have differential corrections such as the Wide Area Augmentation Systems, the National GPS Differential Correction Service (beacon) or real-time kinematic differential correction, depending upon the required accuracy. Autosteering systems in agricultural vehicles use the GPS guidance systems with the added option of automatically steering the vehicle. In this case, the mechanical device or an integrated electro-hydraulic control system installed in the cab automatically steers the vehicle based on the GPS signal and predetermined swath width. When using autosteer, the equipment operator only steers during turns and other maneuvers . Though many farmers have been using these technologies for some time, having adopted them based on peer recommendations and anecdotal evidence of the reduced need for costly inputs, the actual benefits in terms of energy and time savings need to be quantified. This study estimated the savings of time and energy attributable to GPS guidance and autosteering systems in North Dakota to develop a precision technology program for the farmers. Estimating energy use reduction attributable to precision farming technology is important for North Dakota farmers. A survey of about 1,000 farmers from different geographic regions of the state was undertaken with support from USDA-NASS, Fargo, North Dakota office. The farmers were selected at random by NASS. The target farmer demographic was the typical North Dakota crop producer, generally consisting of wheat, corn, and soybean growers. The survey consisted of a questionnaire with two main sections. In the first section, respondents were asked whether they had adopted specific precision agriculture technologies, including GPS guidance and autosteer, and how much savings of fuel and machine operator time they attributed to the use of these technologies throughout their operations. The second section of the questionnaire requests demographic data specific to the farm and farm household. Figures 1 and 2 exhibit the survey questions from sections 1 and 2 of the questionnaire, respectively. Section 1 survey questions regarding technology adoption and perceived savings of time and energy. Section 2 survey questions regarding farm and farm household demographics. The collected data were used to estimate the percentage of farm operators who have adopted GPS guidance systems and autosteer technology in their operations. We also used a logistic regression model  to determine how farm size and number of farm workers affect a farm operator’s likelihood of using autosteer and/or GPS guidance. Lastly, we report the average producer’s perception of the amounts of time and fuel saved by using these technologies in tillage, planting, spraying, harvesting, and other activities. Of the 1,000 questionnaires, only 60 were returned completed, which is a very low response rate - only 0.06%. This low response rate likely results from what is known as self-selection bias, which regularly causes difficulties in analyzing mail, internet, and telephone survey data . In essence, self-selection bias means that respondents participate in surveys on topics that interest them. In the case of survey used in this research, we should expect that producers who currently use or are considering the use of GPS guidance and autosteering are more likely to choose to participate. Thirty-four percent of the respondents reported using GPS guidance systems in their agricultural vehicles, whereas 27% of the respondents reported using both GPS guidance and autosteering systems in their agricultural vehicles. Forty-eight percent reported using precision technologies in general to manage some amount of acreage. As a result of self-selection bias, these numbers likely overestimate the percentage of North Dakota farmers using these two precision technologies. In fact, the average farm size reported by respondents was 860 ha - much higher than the average size farm in North Dakota reported in Table 1 - which indicates that operators of large farms were also more likely to respond. Table 2 presents the regression coefficients from a logistic regression model in which farm size and number of farms workers determine whether a producer uses any precision technologies. Note that the constant and the effect of farm size have statistically significant effects on the probability of using these technologies, while the number of farm workers has no significant impact. We also tested to see whether income category had significant explanatory power, which it did not. However, we dropped income from the model because the direction of causality (if it existed) between income levels and precision agriculture adoption is ambiguous. That is, income category may be endogenously determined. Based on the logistic regression model, the probability of a producer with an average size farm (502 ha for North Dakota) and two farm workers using Precision agriculture technologies is P = 1/(exp(−(−2.675 + 0.003 × 502–0.027 × 2)) + 1) = 0.227. In other words, approximately 22.7% of farmers with average-sized holdings in North Dakota use precision agriculture technologies of some kind, including GPS guidance and/or autosteer. Assuming a symmetric, approximately normal distribution of farm size in North Dakota with a mean of 502 ha, 22.7% of farm operators have adopted some type of precision agriculture technology. Thus, the logistic regression model helps attenuate bias from respondent self-selection of the survey. aStatistical significance at the 99% confidence level or higher. 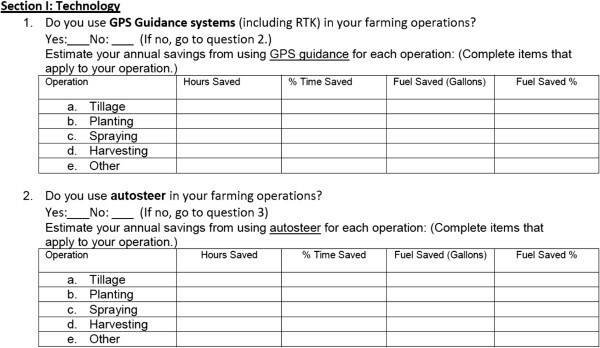 Table 3 shows the amount and percentage of time and fuel savings farmers attributed to GPS guidance systems in their agricultural vehicles, while Table 4 shows savings they attributed to autosteering systems in North Dakota. The average respondent reported saving 65 h of machine operator time by using GPS guidance systems, which is about 6% of the farm operation time. GPS guidance systems also reduced fuel use by 1,647 l (435 gal), which is about 6.3% of fuel use for the average farmer in the sample. Based on these data and a conservative estimate of three dollars per gallon of fuel, the use of GPS guidance systems can save an average of US$1,305 per farm in fuel costs alone. The use of autosteering systems can save an average of 75 h of peak farming time, resulting in a 5.8% reduction of machine operator time, with corresponding savings of 1,866 l (493 gal), i.e., 5.33% of fuel in the farm operation. Based on a fuel price of three dollars per gallon, autosteering systems can save an average of US$1,479 per farm in fuel costs. Based on only the estimated fuel savings, GPS guidance or autosteering systems can provide a positive return on investment within a year or two, depending on the brand name of the system used. However, producers using these systems also report saving time. If producers use hired labor, reduced machine operating hours can reduce the need for hired labor. Otherwise, the time savings allow the reallocation of family labor to other on-farm production activities, off-farm employment, and leisure, which are high-value activities. A conservative estimate for the value of an hour of labor saved is the hourly wage paid to displaced hired labor, which averaged US$11.29 per hour nationally in January 2011 . Thus, the monetized values of time saved for the average farm are US$733.85 and US$851.27 for GPS guidance and autosteering systems, respectively. The study was undertaken to estimate the farm energy savings in terms of fuel and time by using GPS guidance and/or autosteering systems in farm vehicles in the Upper-Midwest region of the USA. A survey was conducted in the state of North Dakota, and the results indicated that there is a good adoption of precision agricultural technology in the region. Thirty-four percent of the respondents used GPS guidance systems, resulting in savings of 6% of time and 6.32% of fuel. The results also showed that 27% of farms used autosteering systems and saved 5.75% of time and 5.33% fuel. Almost 1,870 l (500 gal) of fuel is saved using autosteering systems, and this is equivalent to savings of approximately US$1,500 per farm. Based on the perceptions of farmers who have adopted precision agriculture technology in the state of North Dakota, the two technologies investigated in this research provide a positive return on investment and would be beneficial to North Dakota’s agricultural sector if adopted more widely. GCB has conducted the study, collected and analysed data, and documented the findings. JFN made the survey questionnaire and conducted the study. DCR conducted logistic regression analysis to determine the impacts of farm size and number of farm workers on farmers’ adoption of precision agriculture technologies. All authors read and approved the final manuscript.